My experience with Polish cuisine has been less than satisfactory, but until I visited Poland I assumed this could be blamed on lackluster American copies of Polish originals. I’d tried pierogies from the frozen section of the supermarket and kielbasa from Hillshire Farms and neither suited me. When I tried a fresh kielbasa prepared by a Polish housewife at an upstate New York church supper in the late 1990s, my theory was reinforced. This,THIS kielbasa wasn’t smoky or salty, it was sweet and rich and delicious hot off the grill. I dreamed of going to Poland one day to taste more of this meaty perfection and to sample the rest of what I was sure would be fantastic cuisine. I finally visited Poland in late 2011- Krakow and Warsaw both. I eagerly stood in line at the Christmas Markets is downtown Krakow to taste authentic kielbasa. Guess what, it tastes exactly like Hillshire Farms! Sidenote: I contacted that Polish housewife when I returned to the states and she confirmed that fresh (not smoked) kielbasa is not the standard variety most people associated with Poland. I’m not a fan of that smoky flavor so it didn’t work for me at all. Over the next two weekends I ate my way through Krakow and Warsaw and other than one batch of mushroom pierogies from a dimly lit cellar restaurant, I could not find even one authentic Polish dish that I enjoyed. Clearly traditional Polish food and I are not compatible. I am an avid cookbook collector and like to frequently add to my collection with authentic cookbooks highlighting local ingredients and cuisine from my recent travels but I was so turned off by Polish cuisine that I did not bother to purchase a Polish cookbook during or upon returning from the trip. So it was to my surprise that as I thumbed through From a Polish Country House Kitchen at a bookstore one afternoon, the recipes and the beautiful photography that accompanies them whetted my appetite. 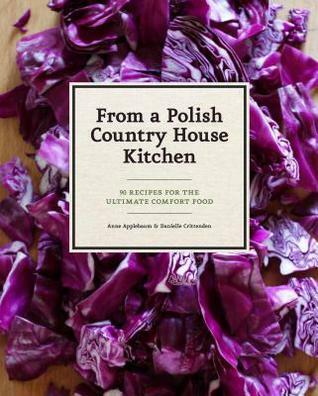 Here were almost a hundred recipes from Annie Applebaum, living in Poland, utilizing local and well known Polish ingredients (cucumbers, beets, fish, cabbage, etc) as well as some traditional Polish culinary forms (pierogi) but in ways I had not seen before. Applebaum provides several recipes that are simple twists on Polish classics and yet many more that are reminiscent of the Polish larder while simultaneously betraying a cross cultural influence. This was Polish food, reimagined; this was Polish food I could get behind. So far from the book I have sampled ‘Mizeria Dziadka Benjamina’ (Grandpa Ben’s Cucumber Salad), ‘Kotlet Schabowy’ (Wiener Schnitzel, Polish Style), and ‘Nalesniki’ (Rolled Pancakes with Jam). All of the recipes were clearly written, easy to follow, and Applebaum provides a short introduction for each describing the history and inspiration for the dish. I especially like that many recipes have both English and metric measurements provided. While I admit I will probably find excuses to avoid attempting some of Applebaum’s recipes that seem to come a little too close to traditional Polish cuisine for my tastes (Beet Soup? No thanks.) there are many recipes I can’t wait to try such as Braised Cabbage with Wine and Nutmeg as well as Stuffed Chicken Breasts with Cognac Sauce. I would think this cookbook would be an especially lovely gift for American expats living in Poland who need to lean heavily on ingredients available in Polish markets. Sign into Goodreads to see if any of your friends have read From a Polish Country House Kitchen.